A clean-label breakfast sausage is as close as your grocer's freezer. 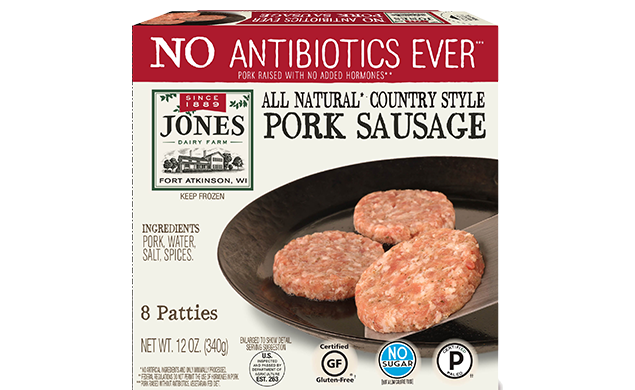 Jones' all new country style pork sausage patties are made with vegetarian-fed, hormone-free pork, with no additives, preservatives, MSG, nitrates or sugar. That means, all you get is authentic, clean-label pork sausage with the same great flavor you've grown to expect from the Jones family. Certified Gluten-Free and Certified Paleo, it contains only ingredients that come from nature —pork, water, salt and spices. That's why you'll find it in the frozen section. Keep frozen. For best flavor use within 30 days. Use thawed product within 2 days. Cook pork sausage patties uncovered in skillet over medium heat for 8-10 minutes (10-12 minutes if frozen) to 165°F internal temperature, until light golden brown, turning occasionally. Drain cooked pork sausage patties on paper towel.